Why Sponsor Legends Over Madera Air Show 2009? Brand Visibility and Community Support! Legends Over Madera, Air Show 2009 was the most exciting event to come to Madera, California and the Central Valley in many years! We had an awesome line up of entertainment and activities for all ages to enjoy, including a Collector’s car display, possible Wine Tasting area, and a Kids Zone. Spectators will leave the show with great memories, anxious for the show to return year after year. Sponsorship is a wonderful way to capitalize on this excitement, building brand awareness and increasing sales opportunities while at the same time supporting the community. We have several sponsorship levels available to you based on your budget and the number of benefits you would like to receive. We can even tailor a sponsorship program just for you to help you accomplish your marketing objectives. Air shows inspire millions of fans each year. With an expected attendance of over 30,000 throughout the 3 days of events you will receive high visibility. Increase your awareness and customer loyalty by riding the wave of their excitement and delivering a brand message to these attendees! Reach millions of consumers through our large media campaign and marketing efforts. Gain tremendous on-site exposure including signage and premier booth space. Receive great hospitality benefits such as access to VIP chalets and VIP parking. Take great pride that you are supporting a thrilling, patriotic community event. There is not a more impressive, more exciting way to promote your company. Air show sponsorship is great for anyone, any company! Who goes to air shows? According to the International Council of Air Shows (ICAS), annual attendance of events throughout North America is approximately 26 million people. Air Show audience demographics show that the consumer-reach is great. Both genders, all ages and every race love the exhilarating action. Air shows are the second most attended spectator sport in North America after NASCAR. During the past decade, air shows drew nearly twice the attendance figures of all NFL football combined. Almost ¾ of air show attendees report incomes of more than $35,000 and more than ½ report incomes of $50,000. Attendees come from an average of up to 100 miles away, some much further away! Air show spectators are primarily young families, 59% are married and own homes, with an average party size of 3.6. The following is a list of some of the many benefits you can receive. Of course, more funding you provide the air show, more benefits you will receive. A Title right is available. Certain sponsors may also receive exclusive sales and pouring rights. Our proud sponsors are given the right to use the Legends Over Madera logo and their designated sponsor level for their marketing materials. As a sponsor, you will benefit by receiving incredible visibility from all of this coverage. Your company logo and message will resonate with thousands of people. The media can always be counted on to provide great coverage of the air show several months in advance up through the actual air show weekend. You too can reap the benefits from the tremendous amount of coverage. Website – Our professional designed website will highlight sponsors and link to their websites. Receive an ad in the air show souvenir program that will be sold to spectators during the show. Media Day always generates a great deal of exposure for the air show and its sponsors. Through an ongoing effort from the show’s announcer, sponsors can be periodically promoted throughout the air show. There will be multiple signs and banners promoting our sponsors. Logos of certain sponsors will be on each ticket sold. World-renowned aviation artist Steve Tack, recent winner of the coveted R.G. Smith Award for his outstanding work in aviation art, is creating the artwork that will promote the show. These will be used in business windows to promote the event. They can also be used for autographs, VIP gifts, and other purposes. Sponsors can enjoy the privilege of entrance to the VIP Hospitality Flight Line Chalet. This is the central air show meeting place for corporate guests, dignitaries, air show performers and other VIPs. These chalets are fully catered. VIP parking passes are included in several sponsorship packages. Country Music star, pilot and avid aviation enthusiast Aaron Tippin will give a concert Friday night at the conclusion of the air show media day and practice day events. Sponsors and other VIPs will receive an opportunity to go backstage to meet Aaron Tippin and the Pilot. This is a great time to get autographs from the talent. Sponsors can receive a preferred vendor/exhibitor booth. This where you and your company can be in the center of all spectator traffic to generate on-site sales, take subscriptions, distribute materials, offer sampling and coupons, provide consumer promotions and execute other marketing initiatives to promote company products and overall increase your brand awareness. As a sponsor you may have the opportunity to conduct contests and sweepstakes at the event. As a key sponsor you may qualify for an jet/aircraft ride-a-long to be used for your personal enjoyment or to use for key accounts, customers, employee incentives, or a special company promotion. There may be an opportunity to arrange some of our pilots and/or Aaron Tippin to visit with you and your company. Several pilots are public speaking experts that can motivate your sales force, talk about achieving goals and how to maintain that edge. These engagements will be "as time permits" but can be way to create excitement. Take advantage of the limitless opportunities to develop cross promotions that will enhance your marketing objectives. 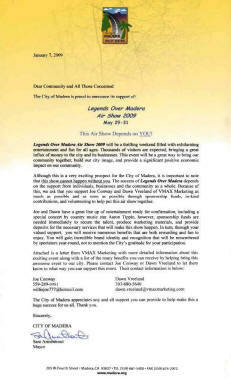 Legends Over Madera will take your business to new heights and have fun in the process. We love to put together ideas for custom events. We are experts in the creative process and will do what we can to help you fully maximize the benefits of being a sponsor. The pilots can appear at selected events that your business sees as a benefit. Or perhaps you want to plan a special sweepstakes offer, cause marketing program, sales incentive opportunity…the ideas are limitless. Increase your exposure even more! If you are an air show sponsor, for an additional fee you can sponsor a plane and have your logos on the aircraft through-out the air show weekend. Ask us for more details! In addition to the awesome exposure and benefits you will receive, as a sponsor, you will be demonstrating significant community goodwill. The community needs your support for this to be a great success…the community will deeply appreciate all your support! We are confident that you will be very pleased with the exposure that you will receive by sponsoring this exciting event! Please contact us with any questions you may have regarding this great sponsorship opportunity. We look forward to hearing from you soon! Please click on the form below, print it, fill it out and fax to us using the fax number on the form.